Studies have shown that lightweight shoes can make a difference in race performance. We have cross-county spikes, indoor, and outdoor track shoes for events of all distances and rubber bottom spikes for those not allowed to use metal spikes. We also carry "minimal" shoes and racing flats. 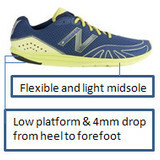 "Minimal" shoes and performance road racing shoes are similar in that they both have low profiles with a minimal drop in height from heel to forefoot, are light-weight, and have less structure than a standard running shoe. Either of these categories can be used for racing or as a tool for strengthening the lower leg and foot muscles. Since both have a minimal height drop from the heel to the forefoot, they both encourage midfoot to forefoot landing. Without structure the foot is allowed to operate uninhibited. These last two facts require more from your body and put a greater workload on those areas being used. These types of shoes are not for everyone. There are few who could train 100% of the time in minimal shoes, but many of us could incorporate some minimal training into our regimen very gradually as a way to strengthen the muscles of the lower extremeties. The key: Don't over do it!